Two twisting grape vines have grown into the shape of a heart. Gleaming Austrian crystals reflect both purples and blues as they form the grape clusters that hang from both sides of this pewter Wedding-Cake Top. Equally beautifull from either side, this Pewter Cake Top is 3 3/4 by 7/8 inch at the base. 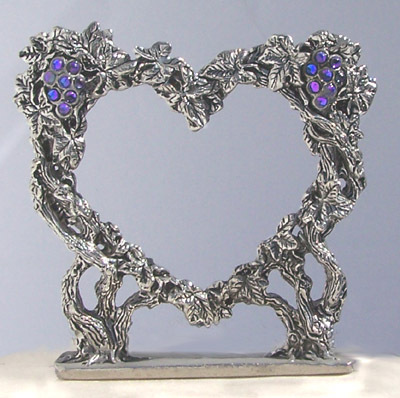 We make it by hand from lead-free pewter and Austrian crystals.